You have a pick-up truck and you know that you need to use it to bring all of your tools and equipment to work with you each day. You think that your options are pretty straight forward. When you aren’t at work you are using your truck for personal use and that means you need a trailer, right? Wrong. Rather than purchasing a trailer and spending an hour each day just to hook and unhook your trailer, consider purchasing a truck cap and save yourself this valuable time. Using a Maranda truck cap instead of a trailer is cost effective and can take you further. Towing a trailer exposes you to some additional risk. This includes inadequate trailer maintenance, limited visibility and incorrect judgement when maneuvering. Have you ever taken the chance to research the risks of towing a trailer? There are a surprising amount of things to keep in mind. One of our customers hit black ice one winter and flipped their vehicle. The cap managed to stay secured to the truck throughout the rolling and appears to have prevented the roof of the vehicle from concaving. Below are some photos our customer sent to us to display the pure strength of these caps. It makes you wonder, what could have happened if this customer had purchased a trailer instead? The Maranda truck caps are an easy alternative to a trailer because they can offer you the extra space you need while minimally affecting your driving. They require little to no maintenance, allow you to have better control over your vehicle, and the only extra space you might need to be aware of is above you. Truck caps are also a safer option when your vehicle is parked. The caps are made with an automotive grade latch system. This system is not typically a component of cargo trailers and thieves know it. Trailers are broken into and stolen all over North America every day. A local family has had their locked trailer broken into and looted three times in just one summer and by simply Googling “Stolen trailer BC” over 6 million results come back. Yet, there are limited results for truck capsules being stolen. At a first glance, a truck cap is more expensive than a trailer. This may be true, at least for start-up costs but, the cost from the beginning of the products life to the end is what really matters. Sterling’s caps can last over ten years longer than a trailer and will save you maintenance, insurance and fuel costs. 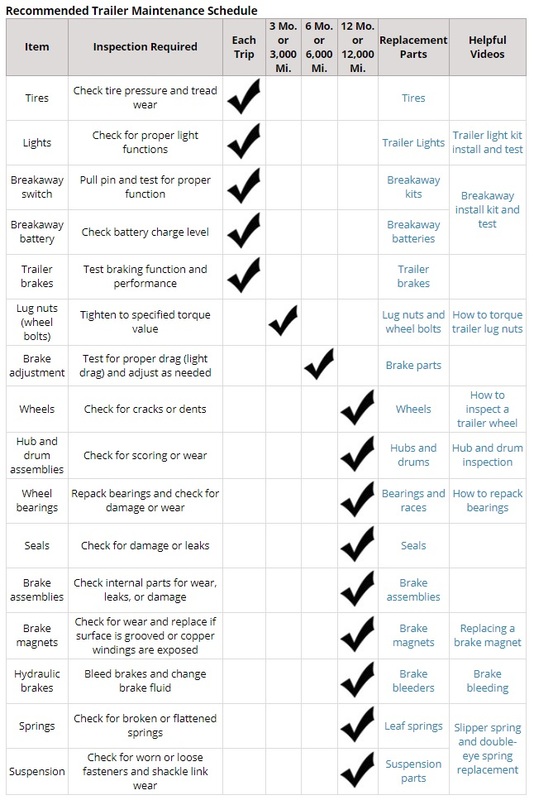 Trailers require a lot of maintenance, check out this helpful Trailer Maintenance Schedule. Unlike a trailer, a truck capsule doesn`t require a VIN number, a vehicle inspection or insurance. You already spend thousands every year for insurance and buying a trailer will only add to it. The insurance for a trailer may not be as costly to that of insurance for your truck but over the trailers lifespan you could save thousands of dollars. One of the best qualities of a pick-up truck is that you can go where most cars can’t. So, why buy a trailer and let that limit you to where you can go? Choosing a Maranda Truck Cap lets you go off-road, quickly find parking and if height restrictions allow, you can even use the Tim Horton’s Drive Thru again. The cap will allow you to bring your truck nearly anywhere you could have brought it before. If you’re a fiber optic splicer check out the cap we have designed for you. Much like a trailer, you can use these caps with other trucks but they don’t need a tow package. The Maranda caps are transferable between any trucks with an 8’ bed. We make it easy. Using Sterling’s instructions, helpful videos and a forklift or alternatively, camper jacks, switching the cap between vehicles is seamless. Say goodbye to parking at the opposite end of the parking lot, 12-point turns and jackknifing. 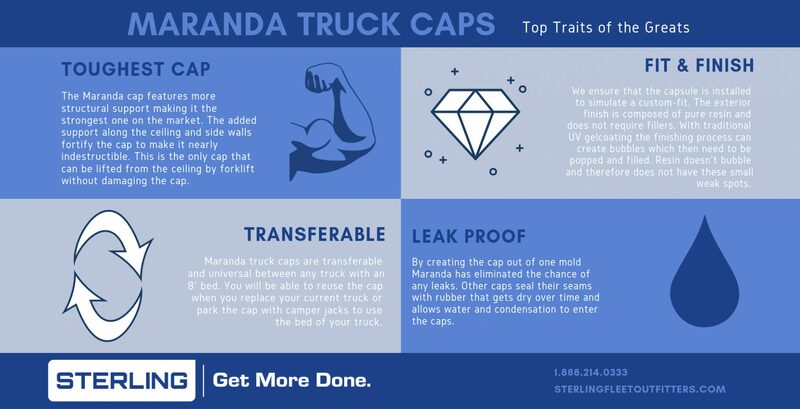 Click here to get more done with a Maranda Truck Cap!